Any parent will agree that sleeping patterns will be completely disrupted when a newborn baby comes along. While it’s true that babies sleep a lot during the day (averaging around 17hours! ), the chances of these hours being in large blocks of time, not to mention during the night, are slim to none. Unfortunately, it’s one of those things that new parents will just have to get used to, and even those that love their sleep will cope. It’s certainly not easy, but soon enough, your baby will settle into a routine that suits both of you, giving the household a pleasant night’s sleep time after time. Until then, there are a few little pieces of advice that may come in handy, to try and ensure the best night’s sleep possible for baby and, indirectly, you. Ensure that you have a good selection of sleepsuits and baby grows, so that they will be comfortable no matter what the weather is like outside. It’s a little cooler at the moment, so a sleepsuit may be more advisable, but as the weather heats up and the summer months arrive a babygrow would be much more cooler for them. Cotton clothing will be the most comfortable option, too, as it’s more breathable and kinder to babies’ skin. Take a look at the George at ASDA’s baby grows and sleepsuits which provide excellent value for money. You can find room thermometers in the shops that can help you to determine the temperature in your baby’s room, but other than that, you can use your thermostat to ensure that their room isn’t too hot. It’s better for the room to be cooler, rather than too hot, to prevent baby from overheating. After all, if it’s a little cool in their room you can keep them warm with blankets and sleepsuits, whereas, if it’s too hot, there’s little you can do to ensure they remain comfortable. The optimum temperature for a baby’s room is 18C, but anywhere within a range of 16C and 20C is ideal. Introducing a bedtime routine is essential so that they can learn to relax and sleep. Something as simple as dinner, bath, and bed is enough in the beginning. Even newborn babies can benefit from consistency. It doesn’t work for all babies, but some love the security of swaddling and will settle far easier if they’re swaddled than if they’re not. In the beginning, baby may sleep better if there’s white noise that they can hear. They’re used to being in the womb, where it’s never silent, so a little noise may help. Something as simple as radio static can help them to adjust to life outside mum’s tummy. Dark, quiet and no distractions – at night-time, their room is to sleep in, and the calmer and more soothing it is, the better. Comfort and relaxation are two of the most important aspects that you can master to ensure that your little ones have the best sleep possible. Naturally, a newborn will take time to sleep through the night and that’s something you’ll just have to deal with, but it will get better – we promise! 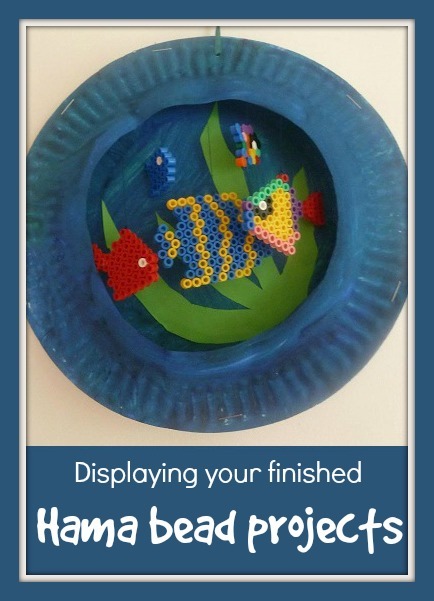 This Easter craft was inspired by the Hama bead aquarium that we made last year, which I was reminded about recently when I wrote about ways to display your finished Hama bead projects. They are simple Easter decorations, combining two of my favourite crafting materials - paper plates and Hama beads. This craft was a fantastic joint effort between the children. Mia helped me to paint the paper plates while Harry was at school, and then Harry made the Hama bead Easter eggs. Some of them he finished a little while back when we bought the pegboard, and he also made a couple of new ones just for this craft. We painted up plenty of paper plates. You need two for each frame, one is used as the background and the rim of a second is used for the front of the frame. With older children you could think more carefully about the background that will be visible in the frame, perhaps a lovely scenic background with hills and sky, or a pattern which matches the Easter Egg which will be displayed. You could also decorate the outside frame with stickers or other collage materials. When the paint is dry, cut out the centre from half the paper plates to make the outside of the frame. Staple them together with the tip of the rims together, so that a 3D frame is formed. 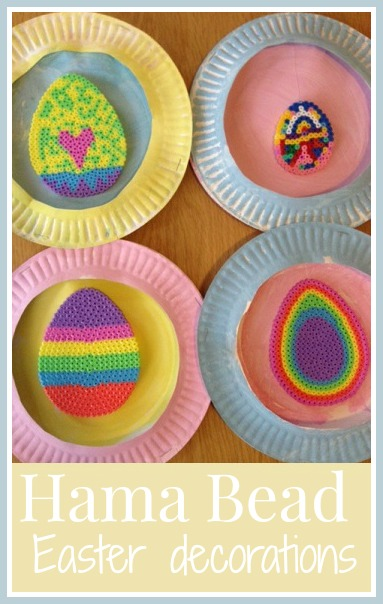 Tie cotton thread securely through the top of the Hama bead egg, then use a needle to push the other end of the thread through to the back of the paper plate frame, underneath the rim so that the egg is hanging down slightly. Leave a long tail on the cotton and use a long strip of sellotape to secure. If you want to hang your decoration, add a loop of yarn or ribbon. Otherwise they can be propped up on a shelf or mantlepiece. Hama bead creations are great for hanging because you can so easily tie thread through the holes. Even if the hole is slightly closed after ironing, it's very easy to poke through again with a needle. You do need to make sure that the cotton is tied tightly to the top of the egg and that the cotton is taped firmly to the paper plate, as the finished Hama Easter Egg can be quite heavy. 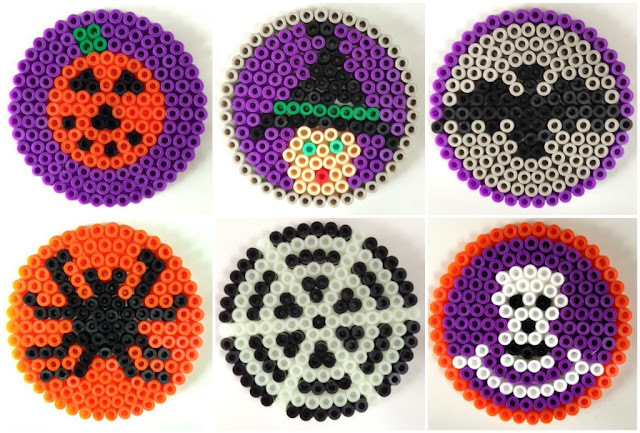 You can find all my Hama bead crafts on my Hama beads page - there's lots to inspire you all year round! I have a new addition to the wall of the room that I call our 'quiet room' - my Mum has done a fantastic job and framed my completed cross stitch sampler for me! It's the Three Things sampler by Moira Blackburn (affiliate link) and I blogged about it here when I finished it - a massive cross stitch accomplishment - along with a teaser photograph, and now I can reveal the sampler in all its fully framed glory! It's a reproduction of a vintage sampler and it has lots of different designs including a gorgeous border and lovely different plants and animals. I think that my favourite part of the sampler is the house in the middle, one day I'd like to design a sampler featuring my current house! The helpful word that was spoken too late. It's a bit difficult to take a photograph of it when the glass is so lovely and shiny and has a tendency to reflect back the rather untidy other half of the room, but I think you can see how the red frame really complements the hints of red in the sampler. I'm so proud of it. 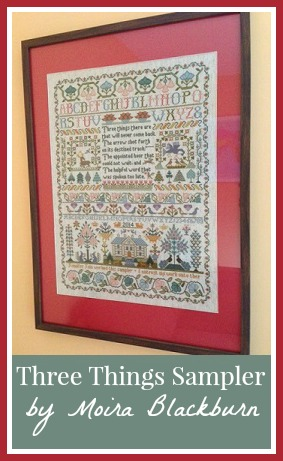 It's a large piece, the frame measures 73 cm from top to bottom and there is plenty of detail in the cross stitch. If you're a regular reader then you'll know how much we like our Hama beads in this family. You can find many of our Hama bead projects here! But it can be difficult to know what to do with all the melted plastic creations that are produced, so I thought I'd share a few ways that we've used to display our finished Hama bead crafts, both mine and the children's! A little while ago I made lots of Hama bead houses. I really like the house pegboard, because it's very versatile and you can vary the design of the house a lot. The finished houses are now lined up along the skirting board in Mia's room to make a little town, enhanced by a rainbow and a car. Harry helped me to arrange them, and decided to continue the theme in his own room with some of his favourite flowers and other creations. I think they look really pretty, bright and colourful, and they can be moved around and rearranged as the mood takes him. I'm thinking about a seasonal display for next Christmas too, so we might make some Christmas trees and other decorations. Perhaps even a Nativity scene. So many possibilities! Another wall decoration is my Hama bead heart hanging display which I made for Valentine's Day, although it's still hanging up on the wall! I think it's really sweet and a bit different. You could display all sorts of shapes, flowers would look pretty or perhaps a row of different vehicles or animals for a child's room. They are a great way of filling a long narrow space in a room. A similar project is my Hama bead hair clip holder. 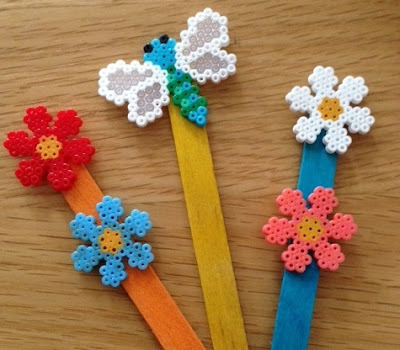 Also using ribbon and with a Hama bead creation sewn to the top and bottom, it's a lovely and pretty way to organise hair clips. We have a round Hama bead pegboard, which is great for making coasters. Mia has been playing with Hama beads since she was only just 2, and can competently fill a shape with the beads. It's fantastic for her fine motor skills (obviously toddlers this young should be very carefully watched when using Hama beads as they are very small) and has helped her with her colour recognition. She has produced many randomly coloured circles, and although I don't iron them all it's nice to have a few to use as coasters. 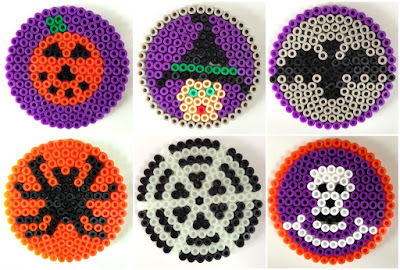 I also made some Halloween Hama bead coasters to use at that time of the year! Also for Halloween, a couple of years ago we made some Halloween Hama bead witches. 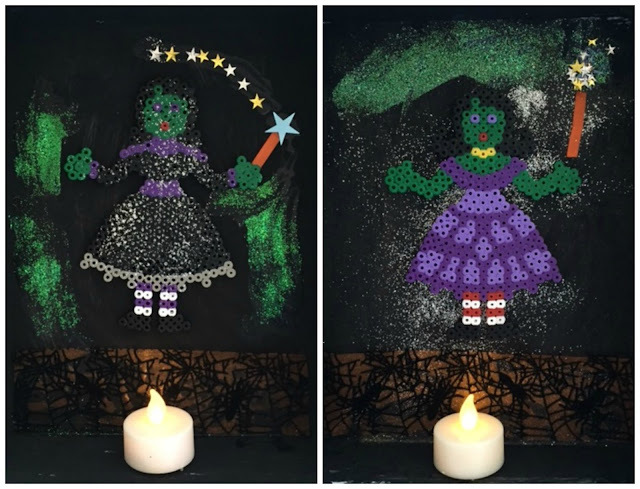 The following year I recycled them into some Halloween frame decorations made with shoebox lids painted black and a battery powered tea light at the bottom to make some Halloween witch displays. Harry remains very proud of his Hama bead aquarium which we made on Under the Sea Day. It's really simple and I think that it looks good. I'm thinking about extending the idea with a similar sort of frame made from paper plates with other objects hanging inside. The paper plate frame is just the right depth for a hanging Hama bead picture and can be decorated in all sorts of ways, great for some seasonal crafting. 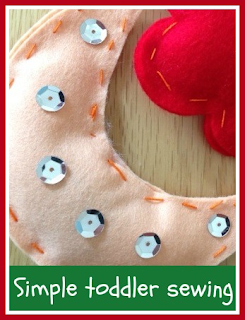 I wrote a Christmas guest post for Mummy Alarm with some ideas for Hama bead ornament cards. The front of the card is a Hama bead decoration which can be removed and used an an ornament. Again this would be a great seasonal idea, you could make Easter cards, Valentine's Day cards or Birthday cards, with a permanent keepsake for the recipient. We've also used finished Hama bead shapes to make bunting, like this Hama bead snowflake bunting, another Christmas craft which could be adapted for different celebrations. I like the idea of making bunting using different letters to spell out a name or a greeting like Happy Birthday. Finally now that I've started having a play with mini Hama beads myself I'm still coming up with ways to display my miniature creations. My favourite so far is these mini Hama bead plant markers, so colourful and pretty! How do you display all your Hama bead creations? I'd love to hear your ideas! The weather has been wonderful for the last few days! At the weekend we took the children down to the beach, and on a whim I gave them each a bucket to take with them. It was a big hit, they loved having a bucket each to collect little treasures in and bring them home. So I decided to have a go at making some Spring baskets that they can take out in the garden or out and about with them to keep the things that they collect. These paper plate baskets would also be great to use on an Easter Egg hunt, or to use to present a small gift. Take your paper plate and make four slits on opposite sides, cutting about an inch into the centre of the plate. 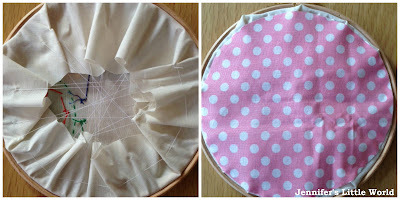 Fold lightly to make a square in the centre. 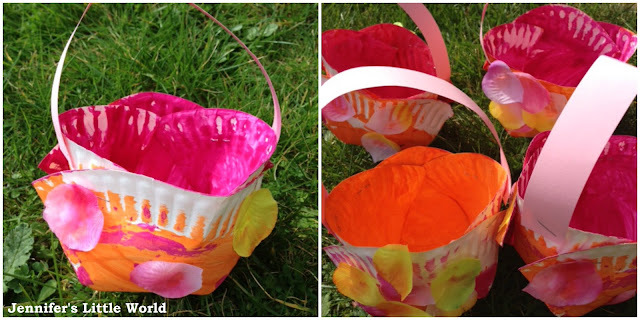 Then paint on both sides using bright, Spring colours - we went for orange and pink. 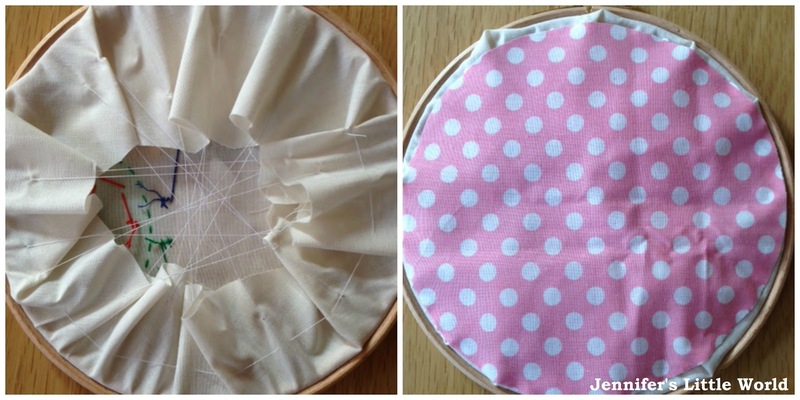 When it's dry, fold up the sides and staple them together to form a basket. Use a thin strip of pastel card to make a handle, and staple into place. 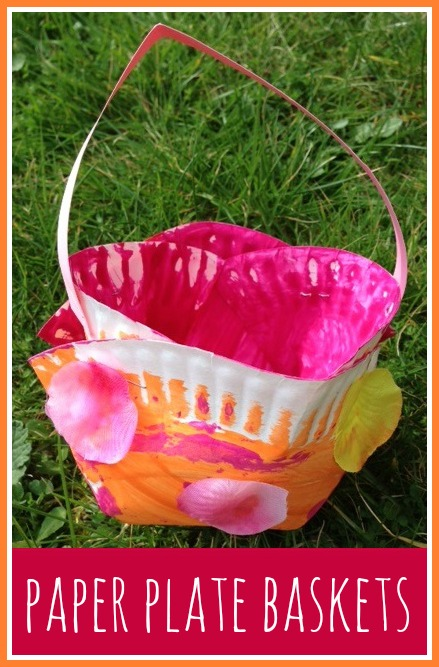 Then if you like you can decorate the basket - we glued on some fabric petals, you could also use scraps of coloured paper, stickers or glitter. As you can see I got a bit carried away, and we ended up with four baskets! Then take the basket out into nature and go hunting. Mia absolutely loved picking flowers, she completely cleared our garden of daisies and dandelions, running back every few minutes full of excitement to show me, and to get me to smell them. Even when she'd finished outdoors she still wanted to play with the baskets, hanging them on the back of her pushchair as she pushed her teddies around. Such a simple thing, and yet so much play value! Embroidery hoop art is another craft that I have discovered since I joined Pinterest. I've even created my own board full of inspiration, which you can see at the bottom of this post. 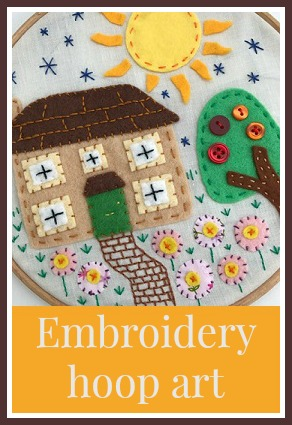 I particularly like the embroidery hoop pictures that have plenty of different stitches, and that incorporate a house and flowers, so I created my own version. If you are a long time reader of my blog you may recognise the felt house that is in the hoop, it's the one that I made out of felt to use as a logo. It's not an exact representation of our house, but it has some similarities, and it's also similar to the house that I've always doodled. The sun has a meaning too, it reminds me of the one that I painted in Harry's room when we decorated his nursery, now probably painted over by the new owners of the house! 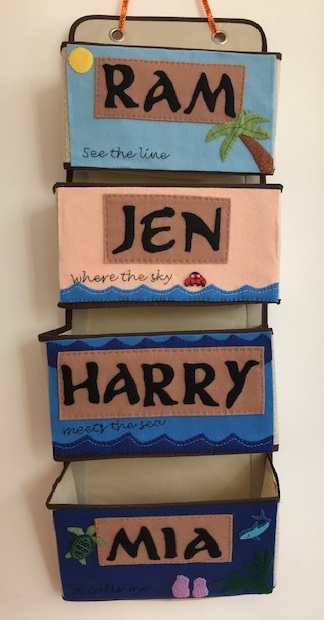 I also took some inspiration from some felt and fabric pictures that I sewed for Harry's room while I was pregnant - you can see them here among my five favourite completed crafty projects. I realised when I'd finished it that I had no idea how to finish off the back, so I thought I'd share a picture. I didn't do the best job and it's something that I need to work on to make it all look a bit tidier. The spotted fabric that I used to back it is a cheap pillowcase from Asda. It took me ages to decide where to place the screw. I quite liked having it a little bit off centre, but then I realised that it was the easiest way to hang the hoop, so I ended up with it at the top. I'm not sure where to put it yet, I'd quite like to put it somewhere that it's not easily seen but where I can still go and visit it. Perhaps in our bathroom. I used a fairly big embroidery hoop for the design, the design area is about 18cm across. I did find myself rather intimidated by the large background area, so for my next embroidery hoop craft project I chose some smaller frames to work with. You can see them here - Embroidery hoop art with button flowers. Follow Jennifer Jain's board Embroidery hoop art on Pinterest. Thursday 6th March 2014 was World Book Day. I've been aware of it for a few years now, mainly from panicked online chatter about costumes. Now that Harry is in school, this was the first year that I needed to help him prepare a costume. I might appear crafty, but I've not had a lot of experience with costume making, so I wanted something easy and definitely from a book that he knew and enjoyed. I recently read Charlie and the Chocolate Factory to him and he absolutely loved it, so Charlie Bucket seemed like an obvious choice. The most important prop was a Golden Ticket. There are lots of printable Golden Tickets available online, I chose one that was quite simple (sorry it's no longer available). We printed it in colour and then I glued it onto some gold cardboard. The book itself also contains the full text that was printed on the Golden Ticket, so you could type it all up yourself into a document and then print onto yellow or gold paper. Then we bought Harry a Wonka chocolate bar. 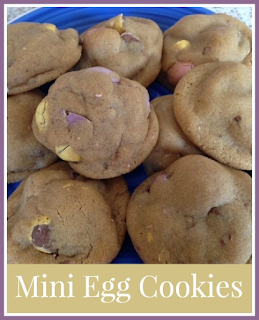 They are easily available in the supermarkets and I have to say that they are delicious! I bought my favourite which is the Millionaire's Shortbread bar. I didn't trust Harry to take a bar of chocolate into school and return with it intact for me to eat, so I removed the chocolate for safekeeping and replaced it with some thick cardboard. Then I just dressed him in some old clothes - a pair of jeans that were a little too short in the legs, and a top which is getting a bit scruffy. He's quite skinny anyway and also generally quite scruffy, so he looks the part! For a different twist on the theme you could even dress your child up as a golden ticket like Domestic Goddesque! You can also find some more Roald Dahl costume ideas here - World Book Day Roald Dahl easy fancy dress ideas. Oh, I am loving mini Hama beads at the moment. I recently posted about a few of the mini Hama things that I've made lately - mini Hama bead projects - and now I'm trying to come up with ways in which I can use and display the little finished pieces that are currently just being stored in a box. 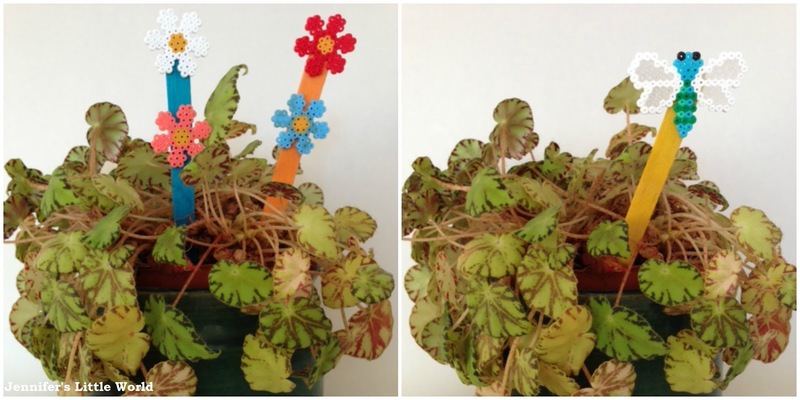 I've started by making some mini Hama bead decorative plant markers. They are really easy to do, just glue the completed design on to the end of a plain, coloured or painted lollipop stick to display in your favourite houseplant. I'm not sure how well they would stand up to outdoor use, although I guess as they are plastic and therefore waterproof they would probably easily last a season or two in the garden before being damaged by sunlight or frost! I really like the look of the completed designs, it's a bit difficult to show the scale in photographs but I hope that the lollipop stick gives some idea. Each bead is about the size of a standard cross stitch, so they lend themselves really well to cross stitch patterns. The flower and dragonfly designs are not my own, they can be found in the Hama Mini Bead Flowers Pack which I received for my Birthday. You could also come up with designs to match the plant that is being used to display them. I do like the idea of making little fruits and vegetables to signify what is actually growing in a plot, for example miniature carrots and tomatoes. They would be good for when you first start sowing seeds indoors, and something pretty to look at while you wait for the seedlings to start growing. I haven't found many mini Hama bead crafts on the web, so if you have some to share I would love to see them!